While about 11 000 people decided to run 56km this morning, and another 16 000 took it easy with the half-marathon, I decided it was perfect weather to cover a little less distance than that, and go for a walk on the mountains. 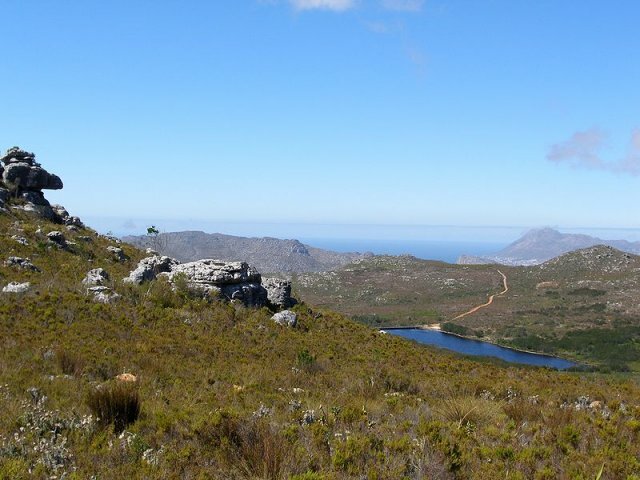 27 000+ people were blocking the route I planned to go, so I ended up walking near Silvermine. Walking is a great mood-enhancer if I’m in a bad mood, and what I most want to do if I’m feeling good, so there’s never a bad time to go. Like most of us, I don’t always end up doing what I want to and I haven’t done much recently, although the summer heat where all I’ve wanted to do was curl up under a cold shower didn’t help. But, the first autumn cold front made perfect weather. I took Dorje sometime in 2014, and it was a wonderfully windy day, hanging on to the beacon in the maelstrom as the clouds poured by, occasionally revealing the sun, or the view below. But that pales compared to the wind today. For most of the route, the wind was moderate, but it picked up in the afternoon, and coming back I took a detour to the lookout point over Hout Bay. As I got closer, sand started blasting my face, and I had to cover my eyes. As I reached the lookout point, I could barely stay upright. The wind was thudding into me, a brief moment of calm, and then raging with all the fury it could muster. I tried using some rusty tai chi to stand rooted on a rock, but just couldn’t keep balanced. I love Cape Town’s wind, but this was too much even for me, and I’m sure the runners are happy it was much milder in the morning! Luckily the wind was blowing from the sea, otherwise I would probably be spending the night half way down the cliff face. Coming back down past Silvermine Dam, unsurprisingly deserted, the water was the wildest I’ve seen, the wind was blowing the water over the dam wall, and any swimmers would have risked being dashed by the waves against the wall. If I’m not too stiff after oiling my walking rust, I may just do it all again tomorrow! Your title contains bad math. What happened to Dorje? Blow away to the Moon?